It is easy to think the Small and Delicious Life is only so delicious because it is spiced with achievement—but independent taste testers agree the greens are crisper, the bacon more flavourful, the bread nuttier. And you get the sweet spice of achievement. But, worried that we would run out of smoky goodness, on the next trip into town C. picked up a packet of bacon—the most expensive bacon at the grocery store. We didn’t need it, so it went into the cooler for the trip home and we had some for breakfast a few days later. Basically, we are ruined for industrial bacon. The flavour was uninspiring and the texture was unpleasant—like eating a burnt cereal box. So stop buying bacon and start making your own. You will eat better, spend less time watching television, and save money. Here is how we do it. We buy our pork belly from The Village Butcher, where they put some work into finding meat from animals that lived relatively happy lives. One belly is actually just one half of a pig’s belly, and this last one was three and a half kilos. After making a couple of batches I started requesting bellies that are more meat and less fat—I think this last belly came from a Tamworth,2 which is leaner than a Berkshire. You can ask the butcher to cut the skin off and trim the belly up for you, or you can do all that yourself. I do ask the butcher to cut off the skin, but I would rather cure and smoke everything else, then save the trimmings for soup. I did cure one batch skin-on but the skin lies unused in our freezer, so it depends what you want to do with it. We follow a recipe from Charcuterie, by Michael Ruhlman—and crosscheck with our other meat-curing bible, Home Production of Quality Meats and Sausages, by Stanley and Adam Marianski3. Charcuterie is more of a recipe and coffee-table book—better for dabblers, while the Marianski book teaches comprehensive principles so the home meatsmith can safely make their own recipes. Bacon is simple. At the most basic, you need only salt, and liquid smoke4 for flavour. However, the classic ‘cured-meat flavour’ and the pinkness of bacon is partly from curing with sodium nitrite. If the meat will age for a long time, like salami, sodium nitrate is used; the nitrate is converted to nitrite during aging. Both chemicals come mixed approximately 20:1 with salt for easier measurement and are sold under several names—Pink Salt, Prague Powder, Curing Salt, et c. Nitrite is Cure #1 and nitrate is Cure #2. Refrigerate for 7-10 days and flip the bags over every two days to redistribute the salty liquid that forms. The meat is cured when it feels firm, not soft. Poke it when you put it in the fridge and try to remember how soft it felt, then compare a week later. When the belly is firm, rinse the cure off and let the meat dry on a rack in the fridge for a day. This allows a tacky surface called a pellicle to form, which will help your smoke stick to it. Before we were given a smoker as a wedding gift, my first smoking was done in a cardboard box. Stalk your neighbourhood on recycling day and find a nice crisp box, about 18” square and two feet long. I found a hotplate at the thrift shop for ten bucks, which goes on the bottom. Put an aluminum pie plate (recycling day) with a cup of dry hickory chips (Canadian Tire, six bucks) on the hot plate. I happen to have a bunch of 3/16 stainless rod left over from projects I did in the last millennium. It is so useful, I think you should just go buy twenty feet of it. But if you don’t want to, fold a little foil tent to cover the hotplate and pie plate—you don’t want any hot fat dripping on a hotplate inside a cardboard box, now do you? Maybe this is a good time to say, do this outside? With a fire extinguisher handy? But remember paper burns at Fahrenheit 451, so don’t panic. 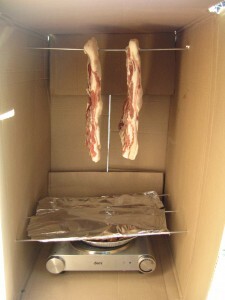 Now hang your meat inside the box, with hooks or more of your lovely 3/16 stainless rod. Crank the hotplate up to high and tape the box shut. I had bad luck using masking tape and good luck with packing tape. Smoke for three hours. When the smoke tapers off, you need to cut your box open and add more chips—three cups should do you for three hours. Don’t get too fussy at this stage—your first batch may not be perfect, but it will probably be the best bacon you have ever had. After three hours take the bacon out and test the internal temperature. It needs to be 65°C/150°F. If it is not, put it in the oven and bring it up to that temp. Let it cool, then freeze it. Then thaw it a little bit—when the bacon is still a little frozen the fat is easier to cut. 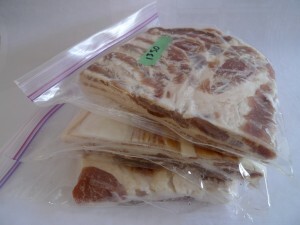 Use a very sharp and slender knife, or an electric carving knife (thrift shop, ten bucks) to slice the bacon into rashers. Portion enough for a family breakfast out on sheets of wax paper before freezing again. Keep all the uneven bits for pea soup or rainy days. Enjoy the Small and Delicious Life! Wait, you’re “developing the idea of Compassionate Systems to address the frustration and failure of behaviour change” while talking about better-tasting bacon? Isn’t there a disconnect there? 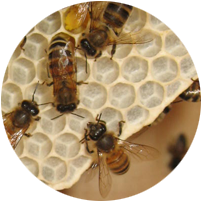 Doesn’ compassion apply beyond the human realm? Just wondering. Thanks for reading and commenting, GreenHearted. I certainly do think compassion applies beyond the human realm. In fact, when we slaughter our rabbits, 80% of the work is put into doing it in such a way that the chances of the rabbit suffering are as small as we can possibly make them. So obviously I disagree that compassion equals everything dying of old age. In fact, a large part of the animal kingdom consists of sentient beings that are eating other sentient beings. Nobody wants to die, but we should all feed life. I think a great driver of the damage humanity does in the world is that we have systematically retreated into the human realm, we have removed ourselves from the ecosphere. I think one of the most important things we can do is rejoin the food chain, with all the pain and sadness that entails. Use your recipe exactly and am now eating really good bacon. I live in the Philippines so all the bacon available is sweetened and disgusting. Do you have the wherewithal to make Ham? If so I would love some tips. Once again thanks for the recipe and the electric hob idea it works perfectly. I am glad to hear the recipe worked for you. We made a big batch to ensure our Christmas breakfasts would be well provisioned so I am enjoying a fresh batch as well. I am preparing for a batch of chorizo, genoa and venison sausages, but I have never made ham—a future project for sure. Even when I was a vegetarian I could not resist my grandmother’s ham dinners. Here is the link to the Marianski’s page on Ham and Meats. There is a lot of reading there, and a big difference between the dried hams—that you would eat like prosciutto—and the wet-cured hams, like my grandmother’s Christmas ham. I was just reading up on the venison, and it mentions Trichinosis. Are you confident your pork supply is Trichina-free? I would also be curious if there is a meat curing tradition in the Phillipines. I tried making dry sausage in August, and had to throw it away when it grew nasty black mould. My neighbour was a sausage maker, and when I told him he looked at me like I was an idiot and said, “That is why nobody tries to cure meat in the summer. You cure in the fall and winter.” If you want to make northern styles of cured meat in the Phillipines, you may need to control the curing chamber’s temperature and humidity. Matt Wright wrote a nice primer on the setup. Anyhow, I am glad to hear you are happy with your bacon, and I would love to hear about your travels with ham! I have been smoking Turkey legs with great results using morton’s tender quick curing salts. However, they’re no longer being sold in Victoria. Where do you buy your curing salts? I have had very little luck finding meat and cheese supplies in Victoria. We bought a lifetime supply of cure when we lived in Vancouver, from Wiberg. But, the Homesteader’s Emporium on Hastings in Vancouver sells lots of cures and bacterias for meats and cheeses. I was strongly suggesting to Rick that he keep shipping reasonable for the Victoria crowd. I did ask the guy at The Whole Beast if he would sell me a little bacteria for fermented sausage, and to his credit, he was amenable. He may be willing to sell some cures. Good luck with that. Let me know if you find a store that stocks these things. I made back bacon using Ruhlman’s recipe (in Ratio). The hardest part was tracking down the Prague Powder, which I found at the Cowichan Valley Meat Market in Duncan. My next project is belly bacon, and I’ll be using your design for a smoker — thanks for that! You’re welcome Dave. Drop a note to let me know how it goes. And…this isn’t the Dave that worked at the Martlet, is it? 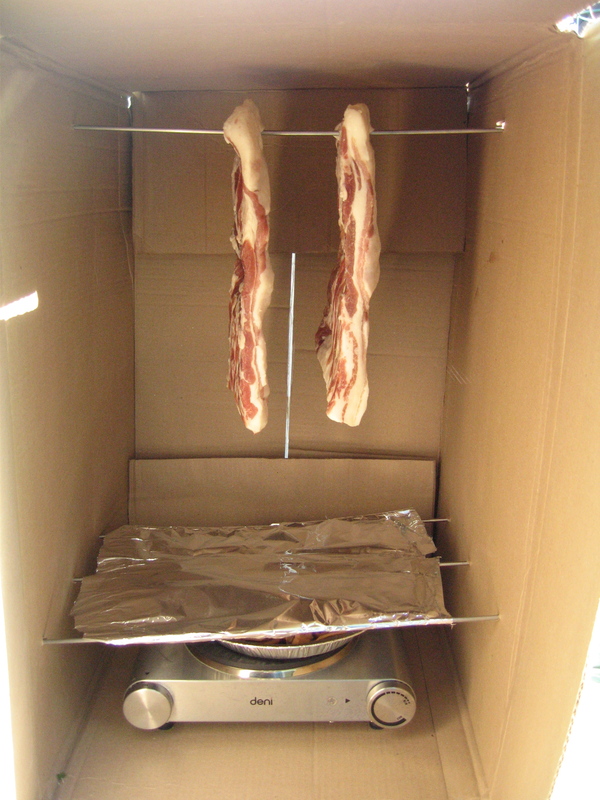 Having flirted with the America’s Test Kitchen method of cooking bacon, we now cook bacon in the oven. Apparently, the Tamworth is a hardy heritage breed well suited to Canada’s climate. And there is also a cute story of a pair that escaped the abbatoir, the Tamworth Two. The Marianskis have an excellent website where they share much of what is in their books. It turns out liquid smoke is literally condensed smoke, you can find it in the BBQ sauce section of better grocery stores, or make it yourself by collecting it on the bottom of a bowl of ice placed over your burning wood chips. I think the Homesteader’s Emporium, in Vancouver, BC, is the closest place to here from which to order pink salt. $7 for a pound. Yes, I see that millions of other people co-invented that method, and then blogged about it.